Our agricultural shows are iconic events in country towns all around New South Wales. I have had the pleasure of attending plenty of shows recently, as the Monaro is in the middle of its show season. I just love them. Nimmitabel Show kicked off the High Country show season on 3 February. I acknowledge John Alcock, President of the Nimmitabel Show Society, and his team for another successful year. Personally, it was a great honour to be the second woman ever to open the Nimmitabel Show in its 115-year history. This year the show featured all the classics, including sheepdog trials, chainsaw races and a stockman’s challenge. A special focus was the junior judging and parading in the sheep and beef cattle sections. There were also plenty of kids’ events to keep families entertained throughout the day. With our proud merino heritage, the Greenland Merino Stud Nimmitabel Show Shear competition is an important part of the day. The competition was devised to promote and encourage excellence within the shearing industry, interest in wool and an appreciation of the art and skill of shearing sheep. In its eighth year, there are now four categories, including the Gordon Litchfield Wool Open Section. The great thing about a country show is, as I said before, they bring people together. My husband—who spends a lot of time on the farm with the sheep and cows, and not a lot of time with people—thinks it is fantastic. We take in our portable yards for the show society to use at all the events, and my husband gets a chance to see and chat with other people—something that is really important for all our farmers to be able to do. The highlight for me was when I got to sash the supreme stud beast of the show, Charolais Curragindi Nulla, exhibited by the Nesbitt family from the Curragindi Charolais stud. In the cattle section, the shed was completely full—six studs with 32 exhibits, and 15 in the commercial section. 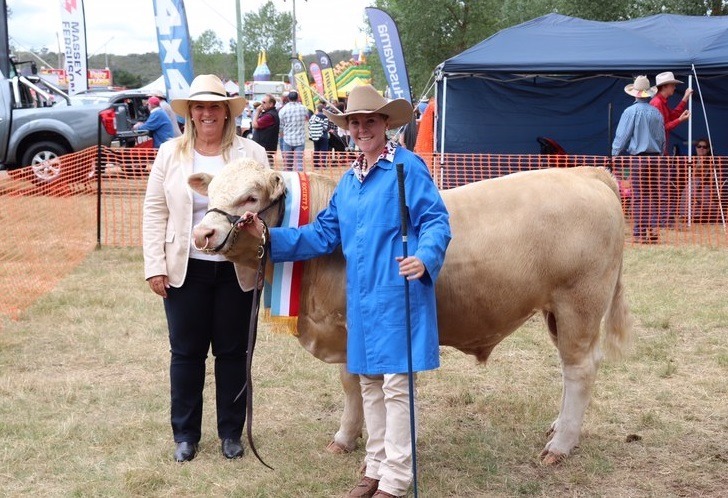 The Curragindi Charolais stud also picked up champion female of the show, with Matilda. The seventy-fourth Dalgety Show was held on 4 March. Life member Mrs Judy Walters opened the show, after many years of volunteer service to the society. She had just retired from her position as head steward of the cooking section. The Dalgety Show boasts some fabulous sections, including vintage cars and a great horse program that brings in riders from all over the south-east. This year it introduced the John Lawlis Memorial Perpetual Trophy for Champion Rooster, following John’s passing last year. John was a local poultry breeder and was greatly respected as a judge and an entrant in many shows. Dalgety also acknowledged the great contributions of other community members by inducting new life members Shelley and Bert Thompson, and Jan and Keith Bennett. It is truly an honour to become a life member of the Dalgety Show Society. 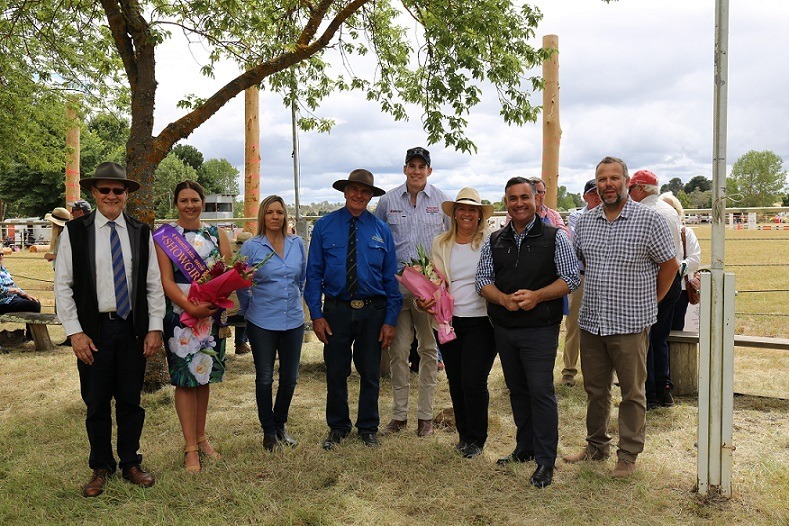 The Dalgety Show is a great community effort that would not be possible without many hours of volunteer service and the community getting behind it. Congratulations to society president Julie Hedger and her team for all their hard work: Annie O’Keefe, Natalee Freebody, Christie Glasson and Trish Gerney. The Dalgety Show Society committee comprises all women, and they are a force to be reckoned with. They punch well above their weight at the Dalgety Show, and are an incredible bunch of really enthusiastic women. The show is one of the finest shows in the south, and I wanted to give them a big shout-out today. They are all really busy with jobs and families, but they get together to put on one of the best shows. Last weekend’s Cooma Show was most exciting because Tasmanian David Foster opened the show. He has held the World Woodchopping Championship title for 21 years straight. Imagine that! He is possibly the only athlete in the world to win more than 1,000 titles, including every major woodchopping event in Australia and New Zealand. Is that not a feat? It is just amazing. Cooma’s 143rd show was held on 10 March. Amazingly, the show has been an annual event since 1875. 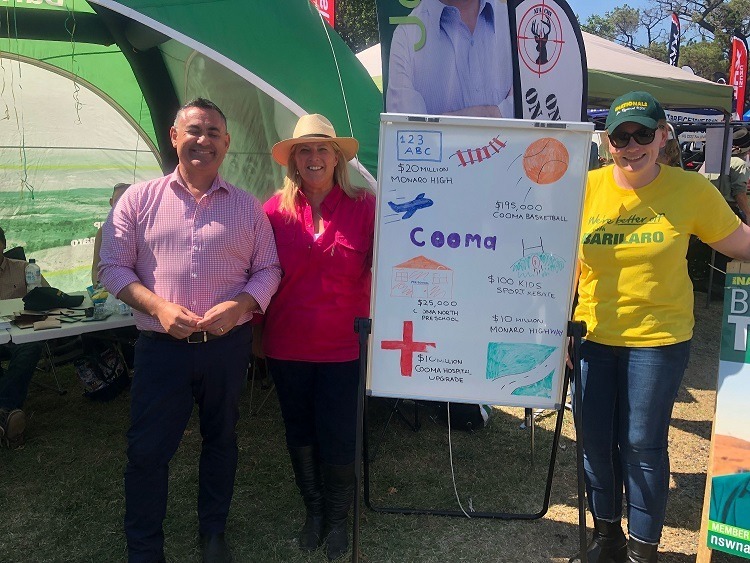 Under the presidency of the fantastic Cathy Wassink, who is a great community leader in Cooma, the show society put on yet another wonderful event this year on a really beautiful day. It was a spectacular Monaro event. I particularly enjoyed seeing the rural medical students conducting health checks at the show. They were a great example of how show days can contribute to the ongoing success of rural communities. Students from the Australian National University’s medical school, which is based at the Cooma Hospital, get a real feeling for what it is like to be part of a country community, practise medicine there, and see how much the community values them. I am pleased to inform the House that my blood pressure was a perfect 120/82. I took the Deputy Premier to have his blood pressure checked, and his was very good too—not quite as good as mine, but very acceptable. Local shows are also an opportunity for local organisations to get out among their communities. I had a great day in the company of the member for Monaro, the Hon. John Barilaro, and numerous volunteers at The Nationals stand. It was really fantastic. We heard from members of the local community about the many ways they see this Government is on the right track and where the Government can still do more, which is very important. This weekend, on Saturday, the mighty Bombala Show will be held in the southern part of the State. I wish the organising committee the best of luck. But at all the shows I am struck by the efforts of the local show societies, the Agricultural Societies Council and the Royal Agricultural Society to engage with young people and introduce them to the show movement. The Agricultural Societies Council has a youth council—Next Generation—that is dedicated to engaging young people, thereby ensuring a positive future for New South Wales agricultural shows. The Agricultural Societies Council Next Generation funds a scholarship for training and development opportunities that will benefit shows now and in the future. That council provides networking and social opportunities for young people throughout country New South Wales. I was very interested and pretty pleased to see that the entire Next Gen committee comprises women and is led by Hanna Barber. With young women leading the way, I have no doubt that things, including the next 115 years of Nimmitabel Show openings, will be a little more balanced. When many people think of country shows, they think of showgirls. The Showgirl Competition has been going since 1962, when 20 young ladies competed for a silver tray and a $200 cash prize. Today, more than 500 young women enter competitions at more than 120 show societies for the opportunity to represent their community and potentially go all the way to the Royal Easter Show. This year the Monaro again had some wonderful representatives including Annette Fitzgerald, which gave me great pleasure because she started preschool with my eldest daughter. I was pretty proud to see Annette come such a long way to represent the Nimmitabel community, which she does so well. The Monaro was represented also by Kristen Whiting from Cooma, who is another great girl and a great contributor. Nimmitabel has a very proud history of showgirls and of women who have led the way. Mel Haylock was the first woman to open the Nimmitabel Show. Mel went all the way and won the State title, which did the Monaro very proud. What is even more tremendous is that Mel returned to the Monaro. She runs a farm with her husband, George, and their three lovely young boys. Mel is a real pillar of agriculture. She makes a huge contribution. She is a community leader. She often mentions to me that it is the skills she learned during the Showgirl Competition that have empowered her to speak up about issues. As president of the Nimmitabel preschool, she spoke out loudly about what needed to happen in terms of policy to ensure that young kids in the Monaro have the same opportunities as young kids in the cities. Mel is a really terrific example of Monaro’s showgirl entrants. I am very proud to know her. I think she is tremendous. Another fantastic Nimmitabel girl I must mention is Emily Blyton. I mention Emily because, as a student of Monaro High School, this year she topped the entire State in primary industries, which is a mighty effort. I know Emily and her family well. Emily says that she loved studying primary industries at school. She grew up on the farm, her father grew up on the farm and her grandfather grew up on the farm. Emily loves agriculture and is really excited about the future. It is pretty tremendous that a student from Monaro High School topped the State. It is amazing. Laura Clarke was also a student at Monaro High School, and is one of my favourite people in the world. Laura was a Nimmitabel showgirl and placed in the top 10 in four-unit English as a result of a film she made. During a drought when things were pretty ordinary on the farm on which she grew up, she wanted to tell a story. Film study was not offered at Monaro High School because of insufficient enrolments. Laura used to arrange for the cleaners to open the school for her early in the morning and late in the afternoon. Laura’s film came in the top 10 in the State, which is a tremendous achievement by Laura Clarke, who is another fantastic girl from Nimmitabel. I also mention Maisie Morrow, whom I had the great pleasure of meeting on Australia Day at the Nimmitabel Australia Day ceremony. Maisie wonThe Land Showgirl Competition 2017-18. Maisie’s mother grew up in Nimmitabel, but does not live there any more. In our role as parliamentarians, we listen to a great number of speeches. Maisie gave a tremendous speech on Australia Day at Nimmitabel. When we talk about opportunities in rural communities, sometimes we may say that opportunities are severely limited and that there is great inequity. However, Maisie said being a female in a rural community gave her opportunities she never thought possible. It was fantastic to see this young and vibrant woman talking about all the positive aspects of living in a country area. I could really relate to that because if I had not married Duncan Taylor and moved to the country, I would not have had half the opportunities I have experienced. I do not think I would be a member of the Legislative Council. Country shows reflect that by exhibiting country communities and societies and showing that opportunities exist for anyone who wishes to step up and take them. The Showgirl Competition aims to find a young woman who will act as an ambassador for rural New South Wales. Her role involves many official and informal duties at both the Sydney Royal Easter Show and during her travels interstate and overseas. The competition is an opportunity for personal development and networking for young women. With the Royal Easter Show just around the corner, I wish all the representatives from across New South Wales who have been selected to represent their zones the best of luck. In particular, I wish good luck to one of our Young Nationals, Alana Black, from Rydal, who will represent Zone 5. Alana is a great girl. Another feature of agricultural shows and show societies is the Royal Agricultural Society Rural Achiever Awards, which is a leadership program that is designed to recognise the leaders of tomorrow who are already contributing to their community and to rural Australia. Nominees are put forward by show societies throughout the State, and eight finalists participate in a networking and professional development program over 12 months. One winner goes forward to represent New South Wales at the National Rural Ambassador Awards. If the calibre of entrants this year is anything like it was last year, people from rural and regional areas of New South Wales are in for a pretty exciting time. The strong show culture and bright future for young people in southern New South Wales is reflected in the 2018 finalists. One finalist is Hanna Darmody from Bungendore, who is a terrific girl. Watch this space: I think she is ready to become the next Premier or Deputy Premier of New South Wales. She is an incredible girl who has enormous potential. I give a really special shout-out to Timothy “Timmy” Green, who was originally from Nimmitabel but who now resides in Wagga Wagga. I have known Timmy all his life. His mother, Mary, was one of my best mates. We both started working in the Cooma oncology clinic when it was first opened. Mary loved her three boys and was incredibly proud of them. Timmy was always destined to do great things, which is really exciting. Unfortunately, Mary died of lung cancer just as Timmy went away to school in year 11. Mary had never smoked a cigarette in her life. It is pretty tough to work in an oncology clinic and then get cancer and find yourself being treated at the clinic where you worked. I remember Mary saying to me when Timmy went away to school in year 11, “Bron, you know, he’s going to do really great things.” It made me so proud to see Timmy standing on stage at the show. I said to myself, “Good on you, Mary. I know you’re looking down on this. Be very proud of him because he’s an incredible young man.” I had to give Timmy a shout-out today. Erika Heffer of Deniliquin and Joseph Murphy of Bribbaree are also finalists, along with a couple of other competitors from parts of the Central West whom I am tempted to claim for the south as well. At the Royal Easter Show there are also the young judges competitions, the Young Farmers Challenge, and the Young Auctioneers competition. These competitions bring together talented young people from around regional New South Wales to showcase their expertise. The Royal Easter Show is just around the corner, kicking off on Friday 23 March and running until Tuesday 3 April. I bet the Minister for Primary Industries is excited about visiting the Country Women’s Association stand. More than 40,000 entries come from across Australia, seeking to be recognised as the best in their fields. There will be arts and crafts, baking, dogs and cats, honey, olive oil, beer and cider, and the Great Backyard Pumpkin Challenge alongside sheep and fleece, goats, cattle and horse exhibitors. Even better for city families, the men, women and children exhibiting at the show are so friendly and proud of their work. Visitors can ask them anything and they will do their best to answer, share their world, educate others and extend their appreciation for agriculture—which is something we should all have. The show is a great opportunity for kids to learn how to milk a cow, turn that milk into butter, see chicks hatching and see how wool goes from the sheep’s back and becomes clothing. I bet the President is wearing a wool suit today. As more and more of our population has no link to the land, the Sydney Royal Easter Show is an important opportunity for city families to keep in touch with the work of farmers and the reality of how their food and fibre comes to be. Some people might think shows are a thing of the past or that people now go only for the rides or show bags. But I am proud to move this motion to recognise the work of local show societies, the Royal Agricultural Society of NSW and the Agricultural Societies Council. These organisations carry on show traditions to protect and promote our primary industries to new generations. They keep up those connections and ensure that opportunities for learning and understanding are provided. Their work ensures that our primary industries maintain the support and trust of the broader public to keep doing what they do best: growing the cleanest, greenest and highest-quality produce in the world.